Why submit your abstract to the IWA WWC&E 2018? • Expand your network and meet new professional partners by engaging with leading water experts. Online submission opens for outline papers (for platform and poster presentations). Final deadline for submission of outline papers (for platform and poster presentations). Deadline for accepted presenters to supply full papers, register and payment to attend the congress. In 2016, the State of Washington’s Office of the Columbia River submitted a long-term water supply and demand forecast to the Washington State Legislature. The forecast, due every five years, provides a system-wide assessment of how future economic and environmental conditions will impact water supply and demand by the 2030s. The forecast evaluates three geographic scopes: Eastern Washington’s watersheds, Washington’s Columbia River mainstem, and the entire Columbia River Basin. The research, coordinated and managed through the State of Washington Water Research Center (WRC), is an analysis of the impacts of climate change, regional and global economic conditions, and state level water management actions on irrigation demands and surface water supplies across the Columbia River Basin, through the use of economic scenarios and state-of-the-art modeling techniques. The research team, led by Jennifer Adam and Jonathan Yoder of the WRC, includes nearly 30 researchers from Washington State University, the University of Utah, Aspect Consulting, and the Washington State Department of Ecology and Department Fish and Wildlife. “The bulk of our work occurs during the five years between reports,” said Sonia Hall, one of the authors of the legislative report, and Sustainable Systems Analyst for Washington State University. Three modeling tools are developed and integrated together to provide the most accurate results. The Variable Infiltration Capacity (VIC) model allows us to track the water balance across the geography of the Columbia River Basin, including how much evaporates and infiltrates into the soil for crops to use; this shows us how crops react to different weather conditions. 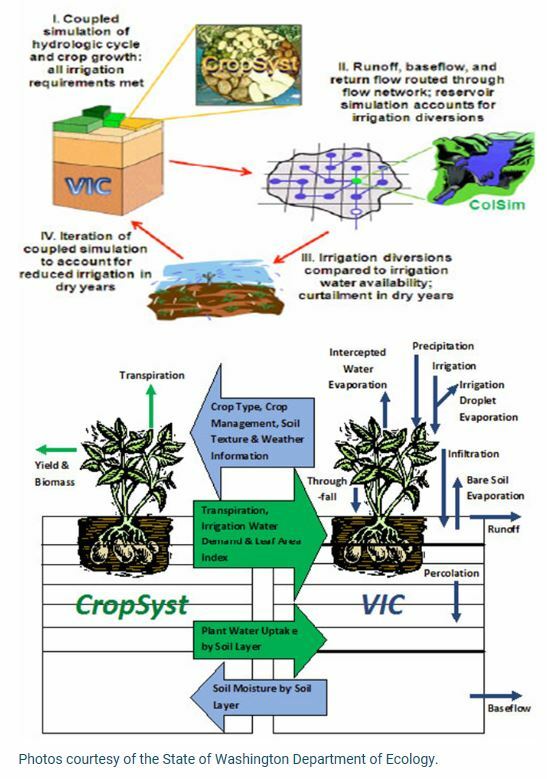 The Cropping Systems Simulation (CropSyst) tool determines how much water is needed by crops through irrigation, how the crop will change during the season under a variety of weather conditions. The Columbia River Simulator (ColSim) simulates the movement of water in the reservoirs and provides detailed information of where water is stored for use by irrigators, municipalities, hydropower generation, and for ecological purposes. The tools work together and complement each other. For instance, VIC informs CropSyst about water supply along with daily weather and Cropsyst informs VIC of water stress levels and crop water needs. Through the use of these integrated modeling tools the research team submitted their latest long-term water supply and demand forecast in December of 2016. They found in the results of their latest forecast that the average annual supply of water for all uses across the Columbia River Basin down to Bonneville Dam is expected to increase around 12 percent by 2035. 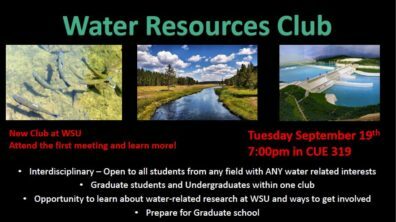 Their research also concluded that water will be available earlier in the spring than it has been in the past, and the demand for eastern Washington’s irrigated acres will decrease almost 5 percent. If current trends in the proportion of irrigated acres growing different crops continue, we can expect to see more acres growing crops like wine grapes, that demand relatively little water per acre, and less acres growing others like pasture, that demand more water per acre. If this happens, demand for water would decrease close to 7 percent. “The demand forecast is important because it helps in knowing how drought conditions will impact the various users, enabling managers to better know how to mitigate the effects of drought,” said Hall. Note: The information in this article was provided by the Agriculture Climate Network, State of Washington Department of Ecology, the University of Washington, The 2016 Columbia River Basin Long-Term Water Supply and Demand Forecast Legislative Report, and the State of Washington Water Research Center. An Equitable Water Future, a new report that explores the impacts of water management on disadvantaged communities, and the opportunities to build more equitable water systems. The paper highlights many promising strategies being developed around the country, and aims to build the field of practice around equitable water management in the United States. 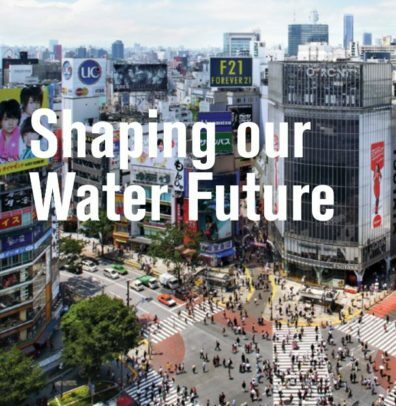 We want to share this report with water research centers, as we believe that academic and research institutions have an important role to play in advancing equitable water policies and practices. We hope that this report is helpful as you advance your work on water and equity. • A draft list of presenters (to submit abstracts via the general call for abstracts) and their tentative titles. The above information should be submitted directly to the Conference Chair, Kevin McGuire (kevin.mcguire@vt.edu), and Technical Program Chair, Bryan Swistock (brs@psu.edu), no later than September 22, 2017. Proposals for Special Sessions will be evaluated by the Conference Planning Committee based on the timeliness and relevance of the topic, and the degree to which the topic will bring together key researchers, educators, and practitioners to disseminate recent advances to the water resources community. Abstracts submitted for an accepted Special Session will be subject to the same submittal and review process as all other abstracts. Proposed special sessions with less than 4 presenters may be filled with talks from the general call for abstracts. However, we encourage special session organizers to propose complete sessions, divisible by units of 4. General questions about the 2018 UCOWR/NIWR Conference can be directed to Karl Williard (williard@siu.edu), Executive Director of UCOWR, or Staci Eakins (ucowr@siu.edu), Administrative Assistant, UCOWR. Want to learn more about UCOWR? Visit our website. This seminar provides an overview of water management issues and contextualizes residential water demand in the West. Residential water demand is determined by household characteristics, policies, social norms, personal motivations, climate, and weather. We will discuss the methods for estimating water demand based on these explanatory variables and our current understanding of household water use. We will also touch on key economic concepts, the institutions within which water is managed, the “buy and dry” phenomenon, water utility operations and policy, and the condition of water infrastructure in the United States. Alexander Maas is an Assistant Professor in the Agricultural Economics and Rural Sociology Department at the University of Idaho. He received his doctorate in Resource Economics from Colorado State University and has spent the past five years researching water use decisions and management institutions. As part of the Urban Water Innovation Network, his research was primarily focused on the development of decision support systems for management of water resources and providing policy makers with the tools necessary to identify vulnerable areas and assess tradeoffs. In addition to his academic work, Dr. Maas served on the Fort Collins Water Board, which advises city council, acting as a quasi-judicial body. He also worked on a collaboration project with the Nature Conservancy and Dow Chemical investigating watershed ecosystem services which received the Roy Family Award for Environmental Partnership from Harvard University’s Kennedy School of Government. • NWC Cooperative Projects: COMET anticipates awarding two-four competitively reviewed, 1-2-year projects, each with a budget maximum of $40,000. The deadline for submission of a preliminary synopsis is October 2, 2017, with the final proposal due December 15, 2017. For more information, please see NWC Cooperative Projects RFP and the guidelines for NWC Cooperative Project proposal submissions. • NWC Partners Projects: COMET is currently accepting 1-year NWC Partners proposals (budgets limited to $15,000). Proposals will be reviewed as received, and approved submissions will be funded until program resources are expended. For more information, please see NWC RFP Details. It is anticipated that up to six projects will be awarded. For details on these projects, see NWC Partners Proposals.